So apparently “cake balls” or “cake pops” are a new American dessert trend right now… everyone is making them, and some people (like Bakerella) are making some really extraordinary designs. I decided it was time to jump on the bandwagon, and give cake balls a try. Next time, I will probably use regular cake mix just to speed it up. I would probably also use chocolate chips to coat the truffles, rather than candy melts or the dolci frutta that I got in the produce section of the supermarket. Microwave chocolate chips in the microwave at 70% power for 30 second intervals, stirring in between to melt. Add a couple of teaspoons of canola oil to thin (do not add any water or water based liquids or the chocolate will seize!). 3 regular sized (16 oz) bags of chocolate chips should be enough to coat one cake mix worth of cake ball truffles. I did half chocolate, half white chocolate, and used contrasting (leftover) melted chocolate to decorate. 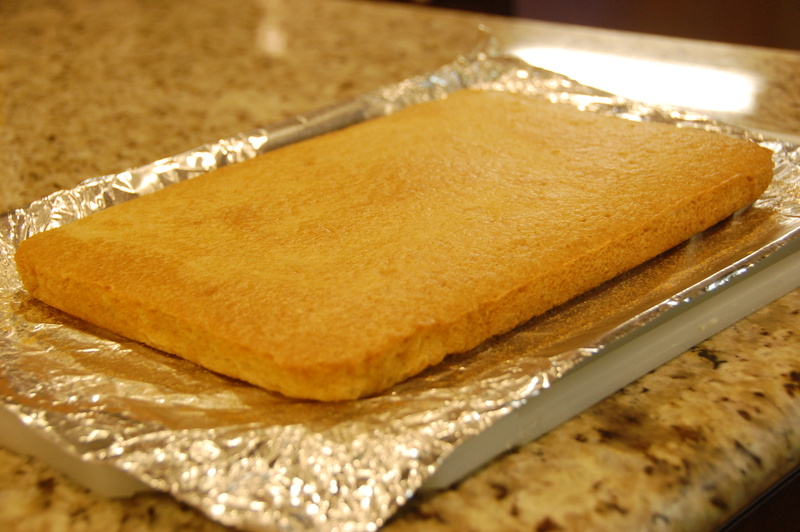 White cake (from a box) + 1 1/4 c. peanut butter. Use about 2+ bags of milk chocolate chips to coat. These are to DIE for!!! Devil’s Food cake (from a box) + 1 jar (13 oz) Nutella. 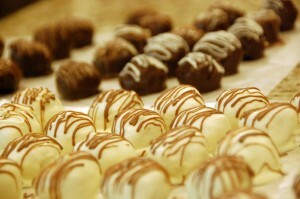 Use a 1:3 ratio of milk chocolate chips to white chocolate chips for a nice light brown chocolate coating. 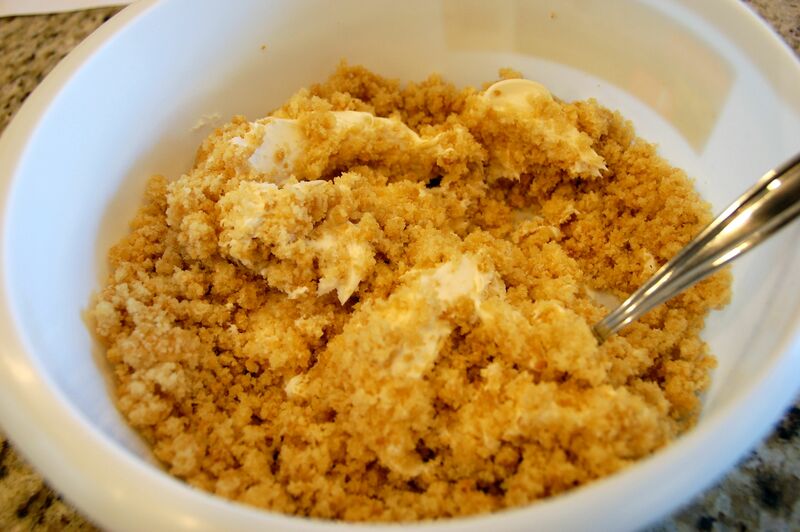 I want to know what’s a good recipe for left over spice cake. All i have is chocolate frosting and I don’t know how that or if it will even work but I don’t have any more money so Idon’t know what to do with the spice cake lost and confused can anyone help me pleeaassee!! Why don’t you try it? Chocolate spice cake doesn’t sound that bad to me… Could be good! I don’t think you can use a soft “spread” in place of a coating that is meant to cool into a solid. If you can’t find any chocolate melts, you could always melt chocolate chips with a teaspoon of shortening, then refrigerate the coated cake balls to harden the coating. 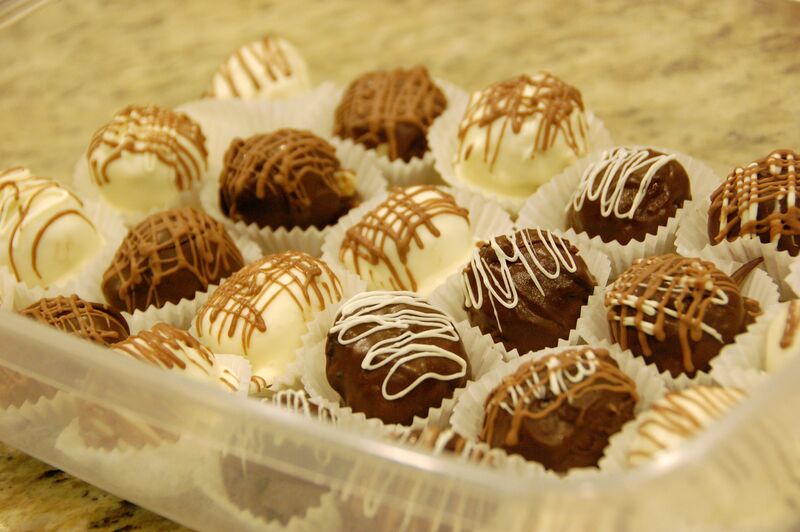 If you cannot find any chocolate at all to coat and melt the cake balls, then the next best thing might be to roll the moist formed cake balls into powdered sugar, cocoa powder, or colored sugar/chocolate sprinkles. If I were to use this recipe to make cake pops at what point do you push the stick into the cake? Thanks mika! To make cake pops, you would probably want to push a lollipop stick into the formed cake balls right before freezing. Yes, the PB or nutella is to take the place of the frosting. Mika, you mentioned that you would use chocolate chips to coat rather than candy melts. Is there a reason for this preference? Does candy melts not taste as good.? I am trying to make these as party favors which is why I wanted to use candy melts for the color. But if they don’t taste as good I will go forego color and just use regular chocolate chips. Thanks so much for answering all my questions!!! You can really use either – they taste the same. 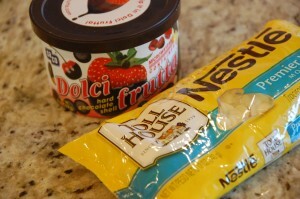 I found it was easier to melt the chocolate chips than the candy melts due to the smaller size. So it’s more for convenience that I liked the chocolate chips better – but you do have to refrigerate them to get melted chocolate chips to harden. Really the candy melts are fine! Hi Mika, how do you prevent the melted chocolate from going hard as it cools down. This happened to the first batch of cake pops I made…! Or do I just need to work a bit quicker…? As chocolate cools, it does tend to harden or stiffen. But you can just return the bowl to the microwave and zap it for about 15 seconds at a time (stirring in between) until it is the right consistency again. I usually will have to stop and microwave a few times once the chocolate begins to stiffen up. I have 3 bundt shaped Rum Cakes leftover, no icing, just a soaker glaze on them. Making crumbs for pie crust and layering with puddings. But I really would like ideas for the cake balls. Suggestions please! 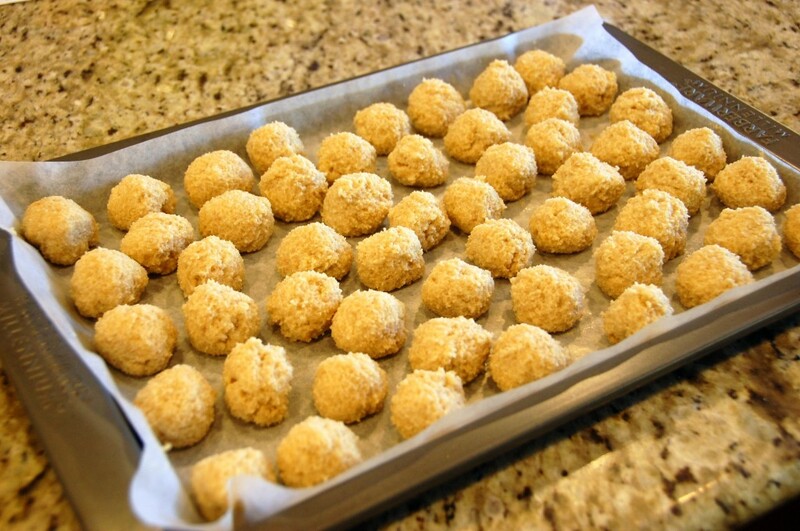 Rum cake balls? Sounds amazing! 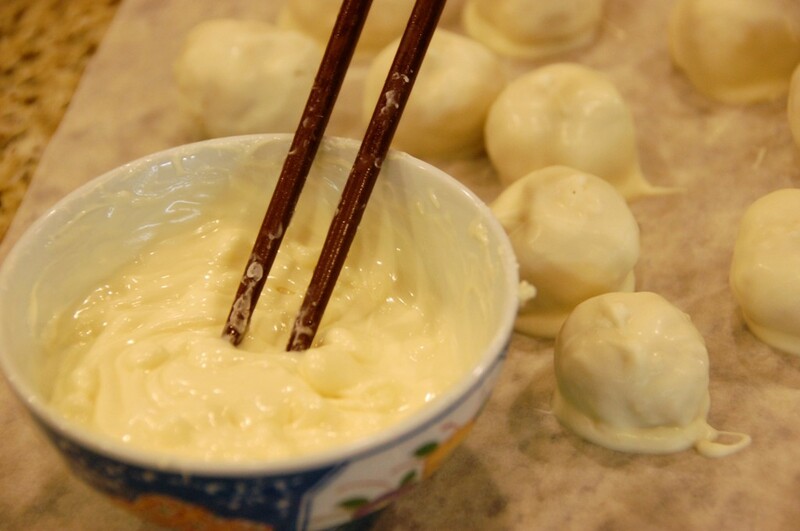 If they already have soaking glaze on them… I would mash them up and see how moist they are before adding frosting… you might not need that much frosting to form the cake balls. I would probably go with cream cheese frosting (maybe with a splash of extra rum) + white chocolate or dark chocolate glaze?